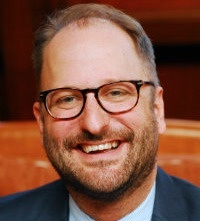 If you’re like most district and school leaders, you started the school year with an excited staff of educators in place, a solid school improvement plan ready to be implemented, various professional development programs set up for the year, and maybe even new curricula that promised to deliver greater student achievement results. By March, those eager, excited eyes you saw in August are tired, worried, and pensive—and those are just the ones in the mirror. You see that the student achievement results didn’t improve nearly as much as your goals stated—in fact, some even went down. It’s defeating and discouraging. The strategies and techniques that used to work, even just a couple years ago, just aren’t working anymore. What do I need to do differently to improve student achievement? What do I need to do to really ensure my educators are effective in making that happen? In our work with districts and states across the U.S. (and now in the Middle East), the root cause of school improvement failure has become increasingly apparent: the lack of systems approaches. Despite best efforts, most school improvement initiatives—especially in high-needs, disadvantaged schools—fail or show little improvement, as evidenced by the recent findings from the USDOE School Improvement Grants. With some estimates showing failure as high as 70% for strategic initiatives in for-profit companies, the challenge is even greater with school improvement efforts. With all the pressing challenges educators face each day, it’s easy to get caught up in the day-to-day fires and priorities and lose sight on where you’re trying to get. Unfortunately, good intentions are not enough when it comes to driving and sustaining growth. So, what do you need to change this trajectory? Below are three drivers and three levers that create a framework to bring about improvement. Scroll down for full explanation of framework. With implementation science research in mind, there are three drivers that need to be in place for school improvement efforts to succeed, including ensuring fidelity of implementation and sustainable long-term results. Principals with site-based hiring responsibility make no decision of greater consequence than the educators selected to join the school’s faculty. This driver focuses on selecting, developing, improving, and sustaining the school and its staff's ability to implement an intervention as intended in order to benefit students. selecting the "right people" to be a part of the school. We often associate highly effective charter schools with Level 4 leaders who are highly effective but struggle to imbue leadership among others or create lasting systems; however, traditional public schools are equally susceptible to success specific to one leader. This driver helps schools build a conducive environment for launching the improvement effort in the short term, and sustaining improved schools in the long term. These drivers are differentiated by what the school has direct control over and those things that are controlled centrally. identifying and mitigating barriers that exist outside of the school as much as possible. This driver emphasizes the technical and adaptive aspects of leadership, since they are believed to impact student achievement the most. There are two types of leadership. Technical leadership involves managing the effective use of agreed-upon and proven procedures or programs (such as a reading program). Adaptive leadership, on the other hand, requires leaders to engage in understanding the complexity of a challenge, convening others to devise solutions to the challenge, and gaining buy-in for the change. Think of the drivers listed above as the “how” for building and sustaining student achievement, with the levers representing the “what.” These drivers move along a classroom-based focus to a school-wide instructional leadership team level. Here are three levers to get you there. As described above, the competency driver’s goal is to ensure a school’s staff can effectively implement school-improvement efforts—and one research-proven tool is a strategic instructional coaching program. According to TNTP, it is estimated that districts spend an average of $18,000 per teacher on professional development, but teachers don’t seem to be improving (especially as evidenced by stagnant student achievement results). focused on a specific context. Do we have thoughtful implementation plan in place, including a clear vision, big-picture goal, small goals (also known as sprints), connections/alignment to existing priorities/programs/expectations, knowledge of what’s working, and a plan for meeting goals? How many coaches are in our building and who is coaching them? Are all our coaches—including instructional coaches and administrators—calibrated on what effective instruction looks like? How are we using video to improve our teachers’ practice—as well as our own as leaders? Recommendation: Check out the blog post How to Build a Successful Instructional Coaching Program, which details the key questions you need to answer to get to success. Teacher-driven professional development is key to driving improvement in instruction. As my colleague, Jason Stricker, discussed in a recent blog, The 5 Shifts Healthy PLCs Make, this can only happen through a process of “bottom-up” change management—and the top-down conditions that support it. Effective school leaders must provide the time and resources to proactively address problems of practice and develop solutions that will ultimately change outcomes for students. Improvement is both a technical and a social process. Superior technique alone is insufficient to bring about improvement. Teachers, like doctors and other practice-based professionals, are most willing to try something new when someone they trust recommends it. Professional learning communities (PLCs) have tremendous potential to improve teaching. In PLCs, teachers can work with one another to discover and develop new practices to help their students succeed. Teachers in PLCs can develop trust among colleagues who support their efforts to improve. However, it isn’t guaranteed that this will happen. Most school system administrators who have had experience with PLCs know that they differ widely in their ability to transform teaching practice. Often, they only help individual teachers improve and very few help schools themselves improve. In recent years, districts have realized the importance of ensuring job-embedded professional development is in place, which means professional learning occurs during the workday, in the workplace, and is linked to the goals set for students. According to the book The Learning Educator: A New Era for Professional Learning, this type of professional development results in increased collaboration among staff, makes common goals more tangible to staff, and reveals higher-quality solutions to instructional problems. In all schools, there are some teachers whose students consistently outperform their peers. These teachers’ students succeed in the same schools, under the same conditions, and facing the same problems as struggling students. While we know that these teachers exist, they seldom get the recognition they deserve, and, all too often, their expertise—what they know and are able to do better than most—remains an untapped resource. In our own attempt to answer these challenges, we developed the Supporting Teacher Effectiveness Project (STEP) framework, a systemic, data-driven PLC structure now implemented in schools around the world. STEP guides educators in identifying the bright spots—assets—that can be leveraged and scaled toward greater improvement and replication. Developed in partnership with the Bill & Melinda Gates Foundation, American Institutes for Research, and other key organizations, the STEP framework helps teachers solve problems through discovering, testing, and sharing better practices. How do our PLCs ensure a focus on student learning? How do our PLCs create a collective responsibility for teaching practice? What’s the framework or process our PLCs use to encourage teacher collaboration through inquiry and dialogue? In what ways can our PLCs focus on continuous teacher learning? How can we ensure shared values, norms, and vision among PLC participants? As Jason Stricker discussed in a previous blog, 3 Keys to Building Strong Instructional Teams, ILTs not only set the vision and goals, but as a cohesive group of leaders, they proactively, efficiently, and regularly work through issues that impede progress so that real student achievement and learning can happen. Each team is composed of school leadership (principal and vice principal), instructional coaches, and select teachers. A key component of a successful ILT is making sure that each team has both "visionaries" and "integrators." Visionaries, as the name suggests, have a big-picture, far-reaching idea of what the school needs to look like and feel like when it is no longer in turnaround status and well beyond the initial years of stability. Integrators, on the other hand, are great at getting things done by tackling issues daily, keeping people disciplined and accountable. They are able to translate the big ideas into action. We recommend using survey tools, interviews, and common sense to construct the leadership team capable of driving rapid school improvement. Each leadership team member should have the sensitivity, grit, and knowledge to lead the school to a greatly improved state. Be open-minded, solution-oriented, and vulnerable. Live the implementer’s mindset and consistently model it for others. View and own all problems in the school, not just those in his/her direct control. Use researched-based tools and processes for conducting leadership team meetings. What processes do we have in place to ensure our ILT is supporting improvement in our school? Are we regularly reflecting up on what’s working and what’s not in terms of achieving our goals? What is the coaching mechanism for our ILT? One of the big lessons we’ve learned in our own work as leaders is that it is easy to get caught up in so many priorities that when you get to the end of the year, you don’t see results. At this point, it’s important to take some time to reflect on what’s getting in the way of gaining traction. As a leader, creating effective systems requires utilizing our three drivers and does take an upfront investment of time; however, the return on that investment can be significant. If you want to avoid getting caught up in doing too many things, build in regular times of reflection for you and your ILTs to unpack what’s really working and what should be taken off the table. 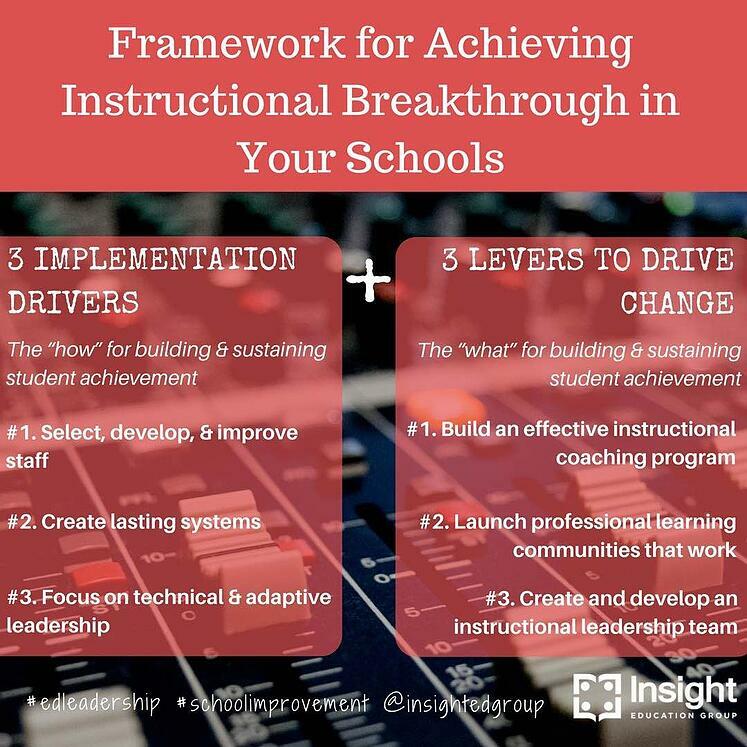 The three levers above, in concert with the implementation drivers, provide a helpful and focused framework for improving instruction across your school. Why not give them a try? Recommendation: Download an executive summary of Insight’s school improvement model TRACTION for School Improvement with these drivers and levers in practice. Want to dig deeper on these levers and hear success stories of them in action in schools? Join us for the National Education Leaders' Workshop in San Diego on March 9-10, 2018. Learn more.